The last week in MLB was about four former great players who were elected in the Baseball Hall of Fame, and a pair of outfielder’s sign deals with National League teams. 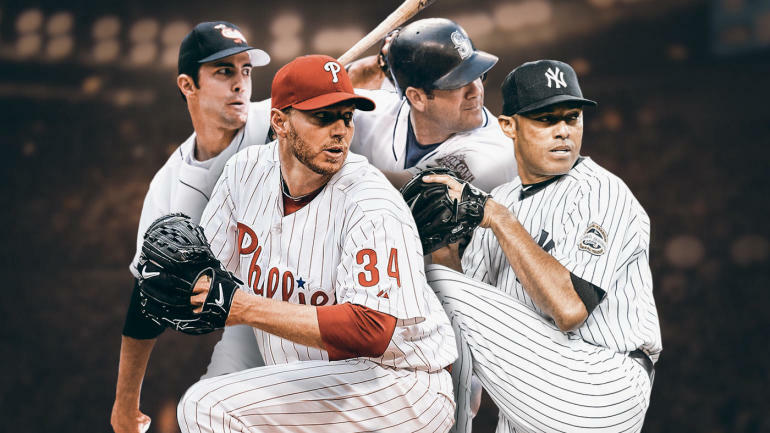 The Baseball Writers Association of America inducted four players into Cooperstown last week and it’s an impressive class which includes reliever Mariano Rivera, starting pitchers Mike Mussina and Roy Halladay and designated hitter Edgar Martinez. Rivera being elected wasn’t a shock, but he’s the first player ever to be elected unanimously, and there isn’t a more deserving player to earn the honor. Rivera will go down as the best reliever in the history of baseball. The reliever is the first Panamanian pitcher elected to Cooperstown, per MLB Stats. The closer holds the all-time record of saves with 652, including nine seasons with 40 or more saves. Rivera has a career 2.21 ERA, 1.00 WHIP, and 205 ERA+ in 1,115 games during the regular season. His postseason numbers with the New York Yankees are just as impressive as indicated by 0.70 ERA and 42 saves in 96 games. The aspect that stands out most regarding Rivera was the consistency, and his cutter was unhittable. The Yankees’ organization and some of Rivera’s former teammates made statements about him making it into Cooperstown, per Mark Feinsand of MLB.com. Mussina won 270 games over 18 seasons with the Yankees and Baltimore Orioles. He has a career 3.68 ERA in 3,562 2/3 innings pitched with 2,813 strikeouts, 57 complete games, 23 shutouts, and a 3.57 FIP. The right-hander didn’t win a Cy Young Award in his career but had 11 seasons winning at least 15 games, including one year in which he won 20 games with the Yankees in 2008. He wasn’t the type of pitcher to blow you away with a blazing fastball, but he had superb control on the mound. There was just one season he walked more than 60 batters and issued 785 free passes during his career. Mussina would change speeds while pitching to different quadrants of the strike zone. His implementation of utilizing a knuckle-curveball complemented the other pitches in his repertoire. Halladay died in a plane crash last year, but he was one of the best starting pitchers during his playing time. He became the first player posthumously elected by the writers to Cooperstown since Roberto Clemente, in 1973, as Clemente also died in a plane crash. The right-hander pitched for the Toronto Blue Jays and Philadelphia Phillies spanning 16 seasons. Halladay won 203 games, posted a career 3.38 ERA in 2,749 1/3 innings pitched with 2,117 strikeouts, and tallied 20 shutouts. He won the American League Cy Young Award in 2003 with the Blue Jays and the National League Cy Young Award in 2010 with the Phillies. He had eight seasons throwing at least 220 innings and threw a no-hitter in his first playoff start. Halladay was an ace in every sense of the word as he would shut down opposing teams from the first inning to the last inning. He was a starter who finished what he started, as he led his respective league seven times in complete games and tossed 67 over his illustrious career. Halladay’s prime stacks up against some of the best starting pitchers in history as from 2008-11 he had a 2.59 ERA, won 77 games, tossed 35 complete games, compiled 11 shutouts, threw 969 1/3 innings, accumulated 853 strikeouts, and his WHIP was 1.06. The next spring, the Blue Jays demoted him to Class A Dunedin. He reworked his delivery and mental focus and came back a completely different starting pitcher. The following year after the demotion, he was an All-Star. The next year after that he won his first Cy Young. Halladay was a special starting pitcher and will be missed within the baseball world from players, coaches, fans and the media. Martinez will be remembered as the best designated hitter in MLB history and a fan favorite with the Seattle Mariners. Martinez compiled a .312 batting average and .933 OPS in 18 seasons with 309 home runs, 1,261 RBIs, 514 doubles, 2,247 hits, 1,219 runs scored, 1,283 walks and 838 extra-base hits. He was a patient hitter at the plate as there were four seasons, he accumulated 100-plus walks. He had an in-depth knowledge of the strike zone, considering there was one year he struck out more than 100 times. Martinez wasn’t your prototypical power hitter as he had one year with 30 or more home runs, but he was adept at hitting the ball into the gap. It was long overdue for Martinez to get into Cooperstown as this was his final year on the ballot. The Atlanta Braves have signed outfielder Nick Markakis to a one-year, $6 million contract, per Ken Rosenthal of The Athletic. The deal also includes a club option for 2020 worth $6 million. Markakis had a phenomenal 2018 campaign for the Braves as he posted a .297 batting average and .806 OPS with 43 doubles, 14 home runs, 185 hits, 93 RBIs and made the All-Star team for the first time in his career. The veteran outfielder was a pleasant surprise for the Braves last year and proved to be extremely durable, by playing in 162 games. Markakis was a tough out for opposing pitchers as he struck out only 80 times and had a robust .366 on-base percentage. He’s been a solid hitter in the majors as indicated by his .288 career average. The Braves will be looking for Markakis to duplicate his success during the 2019 season as the club has high expectations after making the playoffs last year. The Los Angeles Dodgers have signed outfielder A.J. Pollock to a four-year, $55 million contract, per Buster Olney of ESPN. The contract includes a fifth-year option worth $10 million, including a $5 million buyout. He can opt out after the third year by reaching either 1,000 plate appearances in 2020-21 or 1,450 plate appearances in 2019-21, per Eric Stephen of TrueBlueLA.com. Pollock is coming off a good season with the Arizona Diamondbacks as he accumulated a .257 batting average and .800 OPS with 21 doubles, five triples, 13 stolen bases, 21 home runs, and 65 RBIs. He’s one of the best centerfielders in the National League as he has terrific range in the outfield and a strong arm. The only negative part about Pollock’s game is he hasn’t played a full season since 2015 due to injuries. He missed time last season due to a left thumb fracture. The other significant part about the deal is Pollock’s former team, who’s the Arizona Diamondbacks will receive a draft pick and according to Jeff Passan of ESPN should have the most money in the 2019 draft. Underappreciated element of the Dodgers’ impending A.J. Pollock deal: Because it was for more than $50 million, the Arizona Diamondbacks get another Comp A sandwich pick. As it stands, they have the Nos. 16, 26, 33, 34, 56, 75 and 78 selections. Should have most draft $ in 2019. It’s a great deal for the Dodgers as they add a talented player to their roster and it presumably eliminates them from signing free-agent outfielder Bryce Harper.